Tis the season to bring out the glitter! Glitter is something that really divides people; some hate it, some love it, some think it’s juvenile, some think it’s more trouble than it’s worth. It’s true, it can get messy, there’s no two ways about it. However, I think it’s undeniably fun and beautiful to wear every now and then; to a party, on a night out, or even walking around your house if you feel so inclined. We’re in the throes of the holiday party season so what better time to get extra festive and throw a little glitter on ourselves, right? In this post, I’ll give you some quick tips on how I apply & wear glitter that hopefully will be helpful for those of you out there who may struggle with it or who are looking for ideas. Also, I’ll share with you a few of my personal favorite glitters that are oh so beautiful 😊. There are tons of glitters out there at all different price points, but just be sure you’re using cosmetic glitter (i.e. eye-safe glitter) & not craft store glitter from Michael’s or something. That stuff is not safe for use around the eyes! Non-cosmetic glitters can scratch your cornea if any particles get in your eyes, so please be aware. Butter London Glazen Eye Gloss in Mermaid. The glitter is suspended in a jelly formula that sets on the eye after a few seconds, so there’s very little fall-out. TIP #2 – BE TACKY! This is especially helpful when using loose glitters, like the MAC Glitter Pigments for example. Make sure to apply your glitter over a tacky base so it has something to stick to. You also will save yourself from as much dreaded fall-out as possible when you do this. You can use an eye primer or a glitter glue, for example. I’ve heard the Too Faced Glitter Glue Glitter Shadow Primer is very good, or if you want something cheaper NYX does one too. Personally I use my regular eye primer (MAC Paint Pot) and apply the glitter before it sets dry. Sometimes I will simply just pat glitter on top of an existing powder or cream shadow, but I really only do that with the ‘Pop’ shade from The Dolce Vita Palette from Charlotte Tilbury (pictured directly below). I don’t know, that stuff is magic and just seems to stick without a tacky base! Charlotte Tilbury The Dolce Vita Luxury Eyeshadow Palette. The ‘Pop’ shade, indicated by the arrows, is a coppery glitter top coat that is gorgeous. It’s a very “grown-up”, sophisticated glitter. It’s probably my all-time favorite to wear. I find that glitters are best applied by the warmth of your fingers. Brushes tend to drop the stuff everywhere. A simple pressing motion with the soft pad of the finger helps the glitter cling to the eye. I like to wear glitter either tapped all over the mobile lid (with a matte shade blended in the crease), or lining my upper lash line. The Stila Glitter & Glow Liquid Eye Shadows are great for lining because of the size & shape of the applicator. But if you want even more precision, check out the Urban Decay Heavy Metal Glitter Eyeliners. Huda Beauty Emerald Obsessions Eyeshadow Palette. The three shades containing glitter are indicated by asterisks. 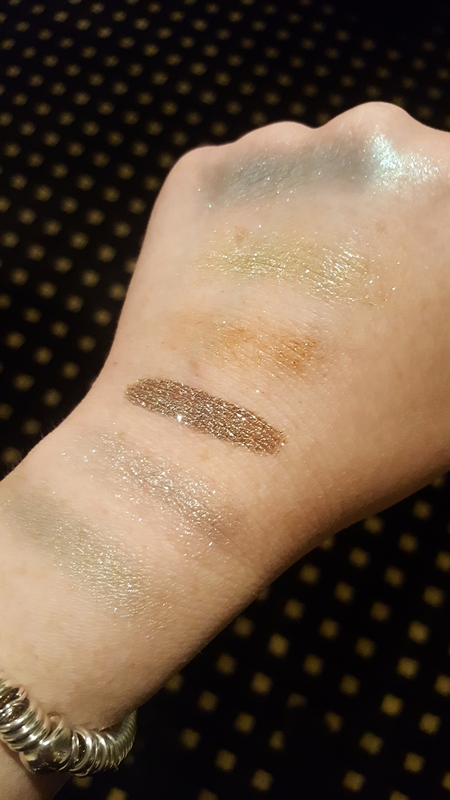 The top yellowy shade is a chunkier glitter top coat, while the two other more green shades are traditional shadows with flecks of glitter suspended in them. If you’re really concerned with glitter fall-out spoiling your beautiful base, then I suggest doing your eye makeup and glitter application before your foundation & concealer. Intutively it just makes more sense, doesn’t it? Then you can just easily remove any fall-out with a makeup wipe, without removing your base. Stila Glitter & Glow Liquid Eye Shadow in Smoldering Satin. This is a revolutionary product in the world of cosmetic glitter, in my opinion. It’s a wet liquid packed with glitter particles that gives off the most incredible high-shine effect. And once it sets on the eye, it doesn’t move! If you want the most out of your glitter cause you’re going to an office Christmas party or a night out with the girls, make sure to pick the right one. I say, go for a glitter that is suspended in something as opposed to loose glitter pigments. Could be a gel (Butter London Glazen Eye Gloss), a liquid (Stila), or a shadow (Huda Beauty Emerald Obsessions Palette). The glitter will be less inclined to fall all over the place as the night goes on, as it’s almost self-contained by its formula. Swatched glitters for your visual pleasure! Top two: Huda Beauty; Third down: Charlotte Tilbury; Fourth down: Stila; Fifth down: Butter London; Bottom: Huda Beauty. TIP #6 – DON’T RUB YOUR EYES! This should be obvious, but just in case you need a reminder 😉. Any time you wear eye makeup, you should refrain from rubbing your eyes but this is particularly important when wearing any kind of glitter. The mess is just more extreme. So hopefully those tips were helpful! I’m planning on doing what I’m calling “7 Days of Glitter” on my Instagram account (@weareglamerus) starting tomorrow in the lead up to Christmas. So if you’d like to see how these glitters look on the eye, make sure to follow me over there! What are your feelings on glitter? Do you crack it out during the festive season? Which are your favorites? I’d love to know! « Holiday beauty gift sets $50 and under – my picks from Sephora! What great advice! We only have one set of eyes and it is so easy to get the glitter in them! Thanks Diane! Glitter in the eyes sounds so awful & painful! No one wants that. Let’s try and keep on our eyes instead! I love glitter on other people. I just can’t wear it myself. My eyes are always itching or watering so I look like a hot mess! Oh, sorry to hear that! I would stay away in that case as well. Watery eyes are definitely not fun. I really don’t wear it until this time of year, and even then I wear it sparingly. I want to have confidence to wear it a little more cause it’s definitely grabs attention. When in doubt, just use it as a liner! It’s less in your face.